Food hackers at Obacchi Jacket Lunch Box cut and arrange ordinary bento lunch box ingredients to recreate famous album covers. See more than 25 pages of these bentos at Obacchi Jacket Lunch Box (use the "Next" link at the bottom of each page to scroll through the site). They look almost too good to eat! That Hendrix and King Crimson are Awesome!! I can't remember the last time I saw that Crimson cover? 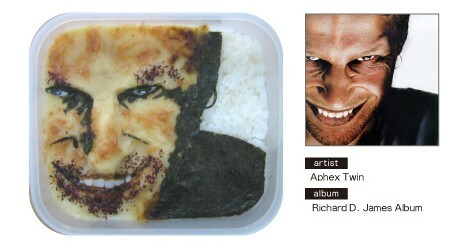 My favorite is the Aphex Twin bento. So detailed! Wow, those are pretty amazing. I wonder how long it takes them to make one! Cool, i read a book not long ago on Bento Box Face Food .... it's a very interesting read. Excellent culinary creations. I wanna eat one! The creation of the Public Enemy album cover in rice and sauce seems very sophisticated. I like this creative approach to the decoration of food. whewwwww!! that Public Enemy piece is really good to see. P.E. pieces.....AWESOME work of ART THERE!! That's not the real cover to Electric Ladyland. Wow, those are simply amazing. I would love these! But I would be afraid to eat them. They are truly a work of art. C-MONSTER.net. » Blog Archive » The Digest. 04.16.08. Bentos inspirados em capas de �lbuns musicais | Saber � Bom Demais!! Bento - cor, alegria e imagina��o na refei��o | Ah! Tri N�! 1� Quinta 09 / semanal interessante.! « Renata Oliveira, Sou. !